Is that just vague enough to be scary? You bet. But, also, just a little bit exciting. Even so, I love clarity. And over the last months, through a lot of prayer, conversations, discernment, worship, and research, I’ve finally found some. We’re going to launch a new thing in Burleson. Just don’t call it a new worship service. Call it a new community, for new people. It will be launched out of, and within, our local church, but our goal isn’t to create another option for weekend worship. Our goal is to break boundaries, bring people into fresh relationships with Jesus, and bless the community of Burleson. Research shows that my community is growing. Like, really, explosively growing. Our city, on the southern edge of Fort Worth, has grown at nearly 4% per year for 15 years and isn’t slowing down. Industry is here. Higher education is coming in. Low income to executive level housing developments are being built. The neighborhood around our own church is still being built out. It’s an incredible time to be here. It’s a time of rich harvest and God is calling my church to labor for the Kingdom. What isn’t here though, in this community, is a whole lot of rest. For the young family, weekends are a rush of activity and adrenaline. While spending time as one of those young families and doing ministry with our Saturday sports ministry, I realized that Saturday might be the first day of the cultural weekend, but it is NO day off. From sports, to errands, to activities, to running all over … There is a lot to do and no rest to be found. And for these same young families, most churches have put an expectation on them to get the kids to church early on Sunday morning, wearing whatever amounts to their Sunday best, be on their best behavior, and participate in the transformational ministry of the Church of Jesus Christ. But even then, as Willimon and Hauerwas lament in Resident Aliens, those ‘blue laws’ that kept civic events from happening on Sunday are no longer in place and they haven’t been for quite some time. Sundays can be just as busy as Saturdays – when that is in fact supposed to be God’s Day of Rest, the Sabbath, God’s gift to humanity, a divinely imposed break to worship, be still, and enjoy family and creation. It's just not restful. It's chaotic. They were taught by the apostles. They gave of all they had. They never ceased to share meals together. And can it be that this could happen in my community? A new, ancient, thing? Our first preview gathering with be on February 24 and we couldn’t be more excited. 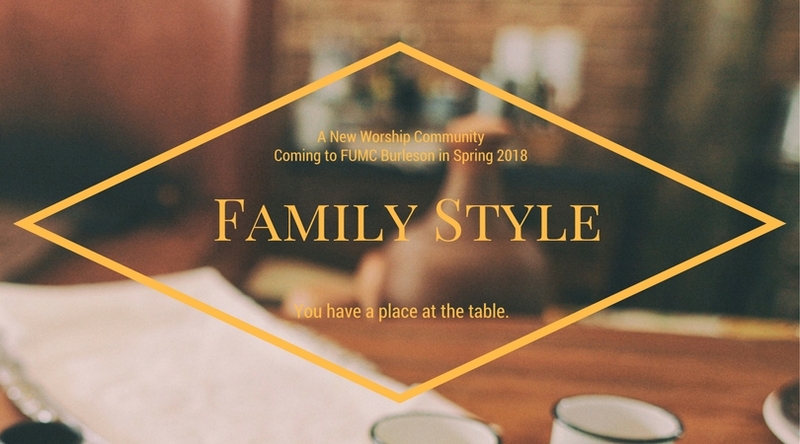 I look forward to sharing more about this new worshiping community in the coming months as things get going. But, in the meantime, what new and exciting thing is happening in your faith community? We’re living into a time where I truly feel that the Holy Spirit is calling the church to dig deep into her roots in order to be creative in reaching people for Jesus today. It is a time to follow Jesus without fear and I couldn’t be more excited to do God’s work in my city. And, for current updates for Family Style, feel free to check us out on Facebook!